Explanation: He possesses profound wisdom. He is full of insight. He is capable of discriminating the right path from the wrong path. He has reached the highest state. I call that person a true brahmana. and who has attained the highest goal (i.e., arahatship). 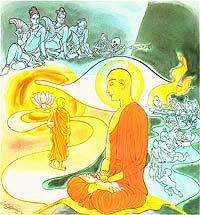 and what does not lead to the realization of Nibbana. hill, the Buddha uttered Verse (403) of this book, with reference to Theri Khema. Story of Theri Khema, Chapter XXIV. this book, with reference to Queen Khema. beauty and she therefore tried to avoid seeing the Buddha. Queen Khema came to the audience hall, she alone saw the beautiful young lady. Khema realized the impermanence and worthlessness of beauty. girl.” After hearing this, Queen Khema attained Sotapatti Fruition. craving, walk on resolutely, leaving, all ills (dukkha) behind. to the Order and became the Chief Female Disciple of the Buddha. including curbing the rising incidence of communal violence. goons were ruling the roost. passing day,” said Mayawati, the previous chief minister. government had “lost its grip on power”. from the BSP government she ran for five years between 2007 to 2012.